SmartContact for IPhone – is among the best contact manager app available in market today, it has all the advance and new features to help beginners to advance kind of users. It is an app that will change the way you interact with your contacts while on-the-go. It will organize your contacts and communication channels (Groups, Phone, SMS, EMail, Facebook, Twitter, Documents etc.) in one place with many advance and useful features in Personal Info Manager. » Need to communicate with your contacts or favourite persons by CALL, SMS, EMail? » Want to send vCard, tweets, message & links to Facebook or friends by just one click? » Do you want to communicate by touching his/her photos? » Tired of filtering or searching person by just name? » Want more advance and powerful search engine? » Want to delete unwanted contacts by just one click? » Want to filter and take backup of contacts? » Want to see the address info in Map? » Want to Add/Remove/Arrange contacts in single or multi groups? » Want to send Group – SMS /Text, EMail with photo? » Want to record your voice and send it to loved once in one click? » Want to take Quick Notes or keep personal documents or photos with Passcode lock? Then ths is the app for you, with many more needed features in today’s competitive world. » Easy to use : Suits any kind of users from beginner to advance. » Automatically Sync with IPhone native contacts. 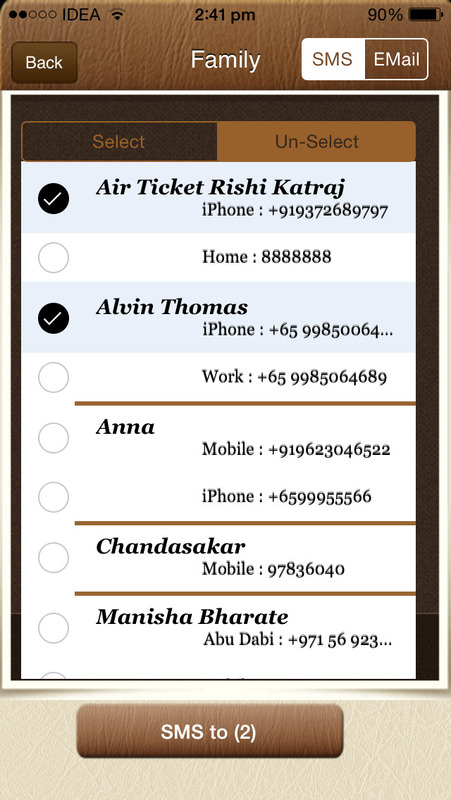 » Contact Quick Info – It displays each contacts (First & Last Name, Company, Phone No’s, EMail Ids, DOB) information’s not just name like in native contact or other app’s. » With advance and Powerful Search Engine – You can search person by Name, Company, Phone Nos, EMail Id, Address. Further you can use (Starts with/In Words) condition to search quickly from your big fat contact list. » Groups – Now you can Add, Remove & Communicate with persons from group in just one click. And also in one click you can send emails and SMS to all Group or selected members. » Visual Photo – Fast way to communicate with person by just touching your favorite or loved ones photo. » Contacts Backup can be taken into .csv files and also can make use of Options to filter contacts before backup. » Voice Recorder: To record your voice or songs or your love messages and send it to your love once in one click. » Doc Reader with print: By which you can easily store / read any kind of supported Documents types like e.g. Words, Excel, PDF, CSV, images, voice or video files etc. Transfer files easily using iTunes. » VCard: Feature added to quickly share contact info with friends. » Communicate with your contacts or favourite persons by CALL, SMS, EMail or send tweets or messages on Facebook by just one click. » Many new features will be added in coming versions. User can request for any new features freely by sending email, we will consider it important if it helps other users also. » Want to check App is compatible with u r device / IOS Version before buying ? Try our free app "npdContacts Free", which has few basic features of "SmartContact for iPhone".